As you probably know, there are a few central yoga debates, one of which is: what kind of music, if any, is appropriate for yoga class? I took on a little project to visit three of Atlanta’s yoga studios for their specialty music classes, and I learned a little something about yoga, music, and myself. I first attended Tough Love Yoga for their Metal Yoga class, then Atlanta Hot Yoga for their Prana + Power class, and lastly, Exhale MindBody Spa for their Music Flow class. The Metal Yoga class was the one that really kicked this whole thing off. I was surprised, at first, that such a thing existed. Heavy metal music playing during my meditation in motion? I’m wasn’t so sure, so I figured I’d have to try before I judged it. What I learned from that class was that Neda, the teacher, is using the music of a class to draw in students that might have been turned off from a more “traditional” class. The class is 100% Anusara-Inspired, and there’s nothing “metal” about the poses, but there is something very “metal” about the clientele. I even found that when I get into full-on flow, that I don’t so much hear the music anyway. Neda and the Metal Yoga class exist to make yoga fun and enjoyable to people. When Octavia walked into the Prana + Power class at Atlanta Hot Yoga, she said, “Now, if I break out into a trance dance, you guys have got to join me.” I laughed, and then I quickly understood the spirit of the class. Prana + Power uses reggae, funk, and other styles of music to show that yoga isn’t so much a serious practice, but one that can be exciting, joyous and challenging at the same time. While we didn’t break out into a trance dance after all, I felt so uplifted that it was as if I had. Then, this week, I tried Exhale’s Music Flow class with Vince, which was a non-stop mix of popular music you could sing to, upbeat classics and a little touch of world music for the calming-down practice. This class was very much of the fast and sweaty variety to show that yoga is accessible to people who like a bit of workout in their yoga and are attracted to the “fitness” of the practice. It doesn’t at all negate the spiritual side, but is chock full of some serious core work and non-yoga workout elements. What all of this reinforced for me is that yoga is an entirely personal practice. There is a yoga class in Atlanta WILL make your heart sing. The students who fill these classes love what the music brings to them. The students feel like they are in their element, the music brings them happiness and it keeps them coming back to the mat. At the end of the day, isn’t that what matters most? 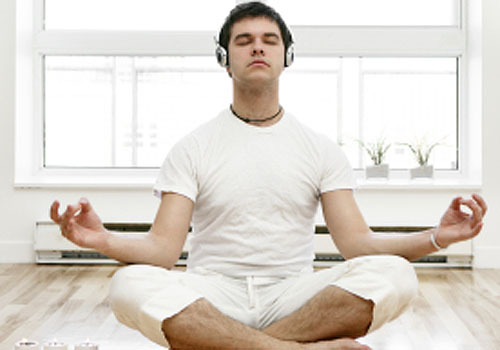 What do you feel about music in yoga classes? Do you choose classes based on their music selection?